Ironically, the Boston Globe last week reported how snarky liberals have been shocked to learn that hundreds of pages of their most intimate psychiatric notes have been posted into the database — available for reading by hundreds (perhaps thousands) of strangers who work for their provider. Now, their most embarrassing recollections are semi-public knowledge, and this was done knowingly and unapologetically by the people to whom they were spilling their confidences. Their privacy is gone, and there is nothing they can do about it. This is the danger that gun owners face — the sharing of medical information (like PTSD) that can be used in the future to deny them their right to purchase a firearm. As for the ObamaCare decision itself, the Supreme Court ruled today that the Individual Mandate (requiring all Americans to purchase health insurance) is constitutional under Congress’ taxing power. Thus, the government can force us to buy broccoli — or anything else — by simply imposing an enormous “tax penalty” for failing to do what the government orders us to do. There is NOTHING the government can’t now do as part of its taxing power. Incidentally, ObamaCare was passed amid vigorous denunciations that Congress was imposing an enormous tax on the American people — and on the middle and lower classes. Thus, by allowing the Obama administration to now argue that it “fooled us,” the Court becomes a co-conspirator in Obama’s fraud. The culprits? Well, certainly the tepid, political-wind-monitoring Roberts, who has sold himself to receive favorable media coverage by the liberal left and to get invited to the swanky parties in our nation’s capital. Ironically, the Senate almost did away with the Senate filibuster in order to secure Robert’s confirmation to the Court. If there is a silver lining to this decision, it is that the Court ruled that the Individual Mandate CANNOT be justified under the Commerce Clause of the U.S. Constitution. This is good news for gun owners, as this text has been illegitimately expanded over the years to justify all kinds of unconstitutional laws — including gun control. Americans now know what we need to do: We need to repeal the Individual Mandate through a legislative rider (or amendment) to the must-pass Continuing Resolution, which Congress will take up around September 30. And perhaps, the ultimate way to get rid of ObamaCare is to get rid of Obama. In the process, we will need to put a constitutional majority in control of the Senate and consolidate and even expand the anti-ObamaCare majority in the House. But the first line of defense is to force a vote on must-pass legislation to repeal or “defund” the mandate. You can expect Gun Owners of America to be at the epicenter of this battle. So please stay tuned for updates! The Supreme Court today released it’s verdict on the oh so blatantly UN-Constitutional ACA / obamacare act. They call it a tax. If that is so then it is indeed time for a modern day tea party. One that includes a rather thorough tar and feathering for five supposedly intelligent people that set the rules that we all are supposed to agree upon living under. But these are the very same idiots that believe that losing ones rights is not a punishment… Perhaps there is a cure. Repeal obamacare in it’s entirity. Pass another law that explicitly forbids the government from passing any law or regulation, or any other means of fiat that requires any person to purchase anything. 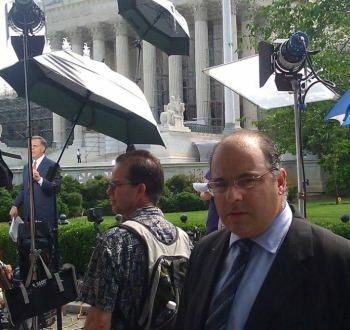 Force Supreme Court Justices to stand for election every ten years. Just how much more of this kind of crap will the American People keep putting up with? Why? I ask, be a “Law Abiding Citizen” when those that Laird it over us themselves so distort the law that they are not abiding by it? Constitutional Carry has won broad support from freedom-loving gun owners nationwide. No citizen should have to beg the government for a permit before he or she can exercise their Constitutional right to bear arms. Simply put, Constitutional Carry is true Right to Carry legislation. It’s the law in Vermont, Alaska, Arizona and Wyoming. 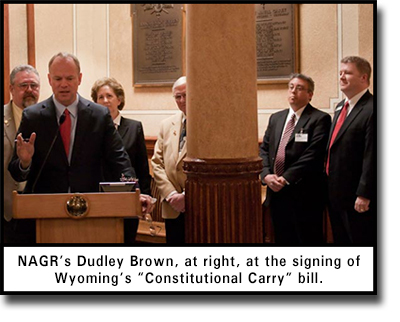 In 2011, the National Association for Gun Rights played a key role in passing Constitutional Carry in Wyoming. Citizens there may now exercise their God-given right to self-defense without restriction. 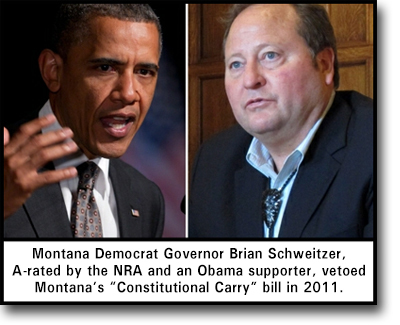 Constitutional Carry also passed both the State House and Senate in Montana with NAGR’s backing during the 2011 session, only to be vetoed by Montana’s NRA “A”-rated Governor Brian Schweitzer. Unfortunately, this pattern of opposition from the institutional gun lobby and the politicians they support was replayed in multiple states throughout the 2012 Legislative season. The National Association for Gun Rights with allied state-level gun rights groups and pro-gun forces nationwide introduced Constitutional Carry bills in 22 states this year. Predictably, the left-leaning media and the anti-gun crowd immediately began predicting blood in the streets. In reality, crime rates have only gone down in Constitutional Carry states. Vermont is virtually surrounded by higher-crime states like New York and Massachusetts, yet Vermont’s crime rate has remained among the lowest in the nation for decades. Violent crime has also gone down in Alaska and Arizona since Constitutional Carry became law. In the face of these facts, it is strange to see anti-gun politicians oppose Constitutional Carry with conjured images of Wild West shootouts. But stranger still is the fact that NRA “A”-rated politicians in numerous states and even an NRA Board Member have joined the anti-gun crowd in opposing the Right to Carry. 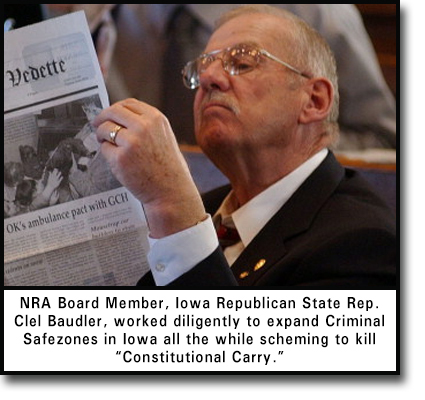 This year, NAGR and IGO led a strong fight, but the bill was killed thanks largely to the outrageous efforts of NRA Board Member and Iowa State Representative Clel Baudler. NAGR ally South Dakota Gun Owners also provided vigorous grassroots support for their Constitutional Carry bill in South Dakota. Sponsored by pro-gun champion Rep. Don Kopp, the bill was stonewalled by the Legislative Leadership in the State House. Rather than support the Right to Carry, South Dakota Speaker of the House Val Rausch and Speaker Pro Tem Brian Gosch cooked up a substitute bill. Hailed as “Constitutional Carry” by numerous NRA “A”-rated and endorsed politicians, this bill would have encouraged police to harass and detain law-abiding gun owners for nothing more than possessing a legal handgun! With NAGR’s assistance, Iowa Gun Owners and South Dakota Gun Owners are now working to hold accountable the anti-gun state legislators who opposed Constitutional Carry. In Georgia, NAGR and Georgia Gun Owners introduced Constitutional Carry and immediately found strong support from gun owners. But once again, NRA “A”-rated State Representative Ann Purcell blocked the bill. As chairwoman of the Public Safety Committee, Rep. Purcell refused even to allow a vote. Thanks in part to the outcry raised by Georgia Gun Owners against her anti-gun obstructionism, Rep. Purcell has chosen not to seek reelection this year. There are similar stories from all across the country. NAGR has also focused resources on Tennesee, South Carolina, Colorado, New Hampshire, and Oklahoma, and is monitoring the battles in Oregon, Idaho, Utah, Nevada, Wisconsin, Mississippi, Virginia, Kentucky, Indiana, Ohio, Pennsylvania, West Virginia, Rhode Island and Maine. Thanks to politicians who claim to be pro-gun and to the political cover provided to them by the leaders of the institutional gun lobby, the battle for Constitutional Carry is over for this year in most of these states. But no one expects to pass Constitutional Carry without a fight. The National Association for Gun Rights is standing firm for true Right-to-Carry legislation. By providing resources, support and direct assistance to dozens of pro-gun state-level allies, NAGR is working to hold accountable the politicians who opposed Constitutional Carry, regardless of the ratings they have received from the institutional gun lobby. And Constitutional Carry will be back in the very next Legislative season. P.S. The National Association for Gun Rights is supported only through the generous contributions of members and supporters like you. Please consider chipping in $10 or $20 to help NAGR take the fight to the gun-grabbers nationwide.